My grandparents live in a small town in Kansas close to a railroad. When I visit them during the winter, I can hear approaching trains more clearly than when I'm there during the summer. Have you noticed this where you live? 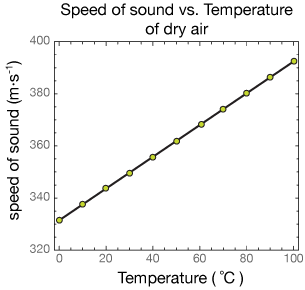 While maybe slower, sound can travel further distances when it is colder. 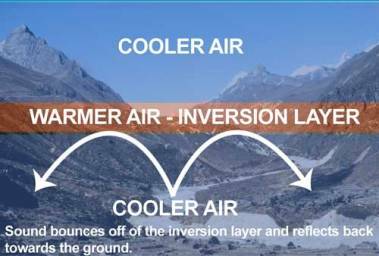 The increase in range is caused by an inversion, which happens when warm air traps cold air near the ground. Instead of the sound wave being transmitted in a single direction, it is refracted away from the warmer air aloft and back towards the surface. The wave then oscillates between the interface of the colder air, the overlying warmer air, and the ground. Snow cover can dampen sounds that you may observe otherwise. As the sound waves are refracted toward the ground, the amplitude of those waves increases. Then, as the amplitude of the wave increases, so does the intensity of the sound being produced by the wave. Whether it is the sound of a train horn or that of an avalanche, when the weather is cold, you will hear that noise at a much further distance than during other times of the year.